Only 18% of organizations say their current leaders are “very effective” at meeting business goals. Only 19% of organizations say they are “very effective” at developing leaders. 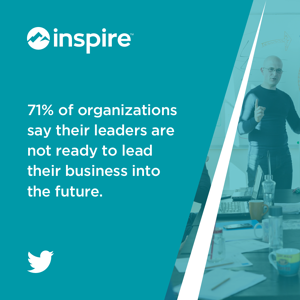 71% of organizations say their leaders are not ready to lead their business into the future. Something has to change! How we lead people today, can't be stuck in the same way we led people 50 to 100 years ago. Traditional leadership functions in a way that excludes a vast majority of people in the company from critical knowledge and a clear understanding of the overall business strategy. In the information age, organizations can't afford to only have a handful of people debating and setting the strategy, they need to find ways to empower the entire organization to find better ways to serve their clients. To fight leadership gaps and inefficiencies you have to build leaders at every level of your organization. The “New Leadership” model is one that easily adapts to the needs and functions off a flatter organization. You need to train and develop your employees to be leaders in their own space and in their own positions, in the flow of their work. Employees, managers, or executives no longer have the ability to take time off to devote to a day long training workshop or development seminar. #LeadershipDevelopment isn’t an exclusive event that is only available for go-getters. Anyone can become a good leader with the right training and development program! @InspireSoftwareTweet This! Even though 83% of organizations say that it is important to develop leaders at all levels, only 5% have implemented development on all levels. 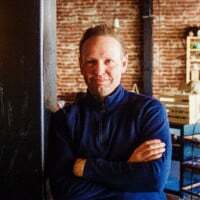 So while many good organizations know they need to create leadership across their entire business, they are failing to do so because of costs or learning models that afford training across the entire organization. As a result, 84% of organizations expect a shortfall of capable leadership in the next 5 years. And with Boomers exiting the workforce and new generations stepping into leadership roles, the time could not be more critical to ensure that everyone in the organization has the leadership skills, in any context, to influence strategy and execute that strategy with efficiency. How can we, as an industry of change, fix this critical issue in our organizations? We need to build a continuously growing leadership culture that transcends your entire organization. The term “millennials” seems to be the focus of many blog articles and break out sessions and HR trade shows. Whether Millennials are perceived good or bad, the reality is that the reality this generational group is reshaping the way we work and the way we lead. Millennials are unlike any traditional workforce we’ve ever seen before and they’re rapidly becoming the ocean of employees and candidate pools businesses will hire from over the next few years. By 2020, millennials will make up 50% of the global workforce. Millennials recognize they need to improve their leadership skills – only 27% of millennial men and 21% of millennial women describe their leadership skills as strong. Millennials are career-driven – 65% of emerging market millennials dream of being the leader or most senior executive at their current company. Millennials are experience-focused – 52% of millennials said career progression was the main attraction in an employer, ahead of salary and compensation. 35% of millennials said learning and development programs was the main attraction in an employer. Millennials know their worth as an employee – Only 18% of Millennials expect to stay with their current employer for the long-term which means they aren’t afraid to find a new job if they feel under appreciated or that their current organization doesn’t provide enough opportunity for personal or career growth. Millennials want training and development opportunities – 22% of millennials rank training and development as the most important benefit an employer can offer, surpassing all other benefits like flexible work hours (19%), cash bonuses (14%) and healthcare (8%). Millennials feel their leadership skills are not being developed by employers and they acknowledge they would like the opportunity to experience some level of leadership training. Second, they want career-driven opportunities like training and development as the norm in the development, not a nice-to-have opportunity. Third, leadership development is one of the core career-driven opportunities they’re looking for! Millennials will make up 50% of the GLOBAL workforce by 2020. 82% of millennials don’t plan to stay with their current employer for the long term. Millennials are attracted to growth and development. These indicate that leadership development opportunities are synonymous to your recruiting and retention efforts. If you want to keep millennial talent, you need to help them develop as leaders and you need to advertise to them that you do that in your organization. There is no quick fix to make #leadership training and development successful. The best path forward is to start building strong leaders today with a well-rounded program. @InspireSoftwareTweet this! Millennials will expect their workplace to include digital tools to allow instant connection and team collaboration. While digital tools may satisfy millennial employees, they could cause issues with employees who are resistant to new processes and technology solutions. One way your organization can easily remedy this is by reverse mentoring, where younger workers are paired with more experienced managers. This gives younger employees the opportunity to teach about the digital tools and methods they use. Leadership development software makes this process increasingly simple because it's largely driven by the individual user to "manage up." Choose a leadership software with goal-setting capabilities that promote coaching and mentorship with real-time performance conversations. Real-time conversations provide employees, managers and executives the opportunity to develop and apply their leadership skills in the flow their daily work life. It's viable and effective alternative to leadership seminars or workshops that normally require a full day off or more. With Inspire Software’s One on One interface, manager and employee alike can solicit and give feedback, set weekly plans, discuss daily tasks toward their goals and collaborate on critical business solutions in real-time. Performance isn’t set and forget process. Inspire helps make productivity flow naturally and effectively through every day work activities. Without goals, employees lack more than a sense of direction; they struggle to see their individual worth - lowering engagement and satisfaction. With a structured goal setting plan worked into your leadership development program, your leaders establish goals that can be aligned to corporate values and with individual and team tasks. No matter the structure of your organization make it easy to track and measure goals as a team. It’s no secret that millennials prefer to manage their lives in the digital landscape. They are the first generation to grow up with smartphones, social media, and much other driving, digital forces displayed in today’s business environment. While there is no quick fix or instant transition to make leadership training and development successful the time to evolve your leadership development strategy is now! You're organization can't wait until the next generation of leaders step up into formal leadership roles. Baby boomers and millennials are completely different in their methods for finding growth and development and, as such, need an adaptable program that fits their unique styles. Integrating leadership development software to supplement your digital-focused employees and cross train your teams diversifies your leadership development stack while engaging a veteran workforce is necessary in today's diverse workplace. This bolsters your overall leadership culture because you’ll have stronger leaders from more diverse groups throughout your entire organization.